Well, we are still in Umbria enjoying our friends’ villa in the remote hilltop town of Macerino. I didn’t think there was any way to top the experience we had in Ristorante Fontana here in the village or at Ristorante Pizzeria Savour in nearby Todi, but it happened. We ran into a husband and wife team who own an organic restaurant in Spoleto in Umbria. 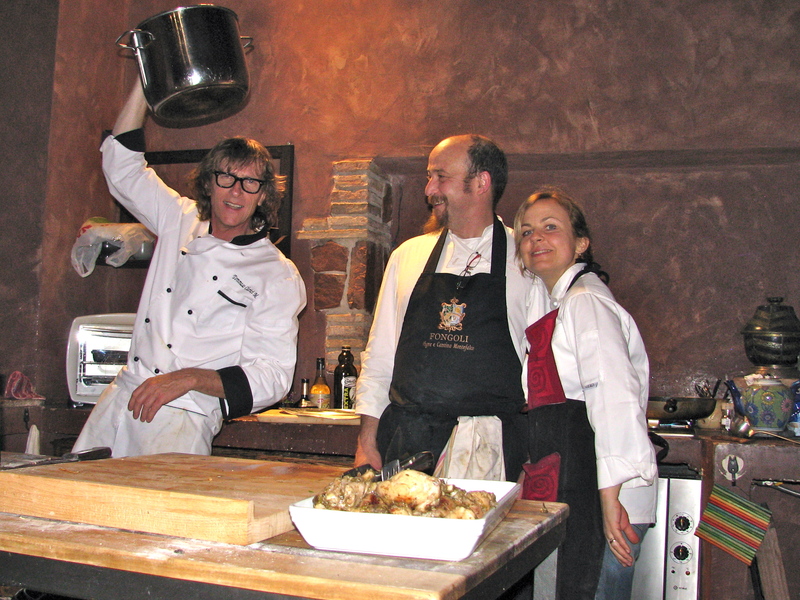 They agreed to come to our place in Macerino and demonstrate Umbrian cooking. Chef Jean Luca and his wife Maria Paula also brought another friend, Carlo Clarici. This trio cooked and entertained us during a wonderful evening. Here are some of the things they did in case you want to try to emulate them back at home. Click on some of the photos to really get the feel. The team brought a huge rustic sourdough bread, aged provalone, baked ricotta with truffles, local sheepsmilk cheese (pecorino), and a eggplant and onion chutney. As we dug in, a few things became clear. First, we don’t eat enough aged provalone and pecorino and that needs to stop – these are really good cheeses so let’s get some next time we’re out. Secondly, who would have thought to shave truffles on top of ricotta and then bake it. Wow, this was really good. Finally, these guys use eggplant everywhere and it is always surprisingly good. For their chutney, they peeled and sliced the eggplant very thin, diced the slices and sauteed with onion. They mixed in slices of pickled ginger to finish it off. Slather this combination on rustic sourdough and you have a treat. This was especially interesting to me since I have prepared this dish many times and have written about it (Cooking and Wooing – Risotto with Black Truffles). 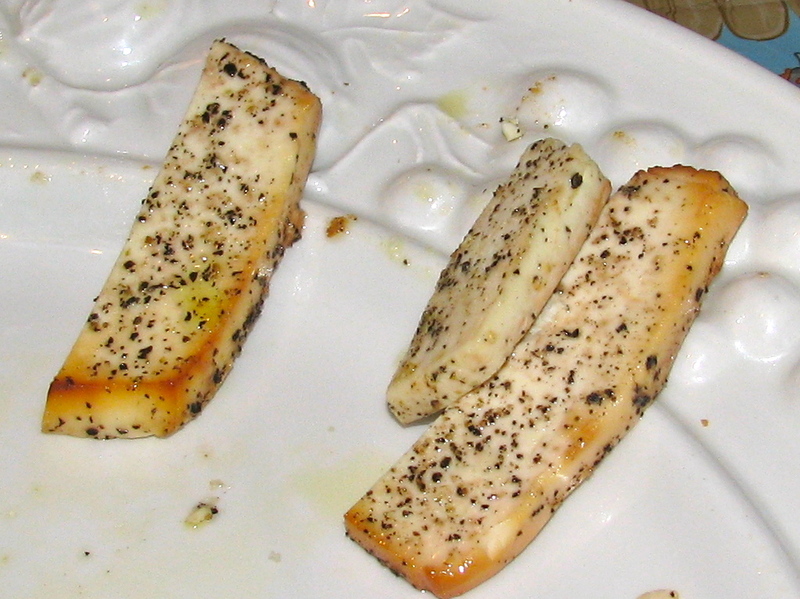 However, I have only used a bottled truffle sauce – our chefs used the real thing. (Since truffles are such an integral part of Umbrian cuisine and since they need to be a much bigger part of our lives, we’ll do a separate post on these beautiful fungi.) Also, they did not use chicken or beef broth – only water. 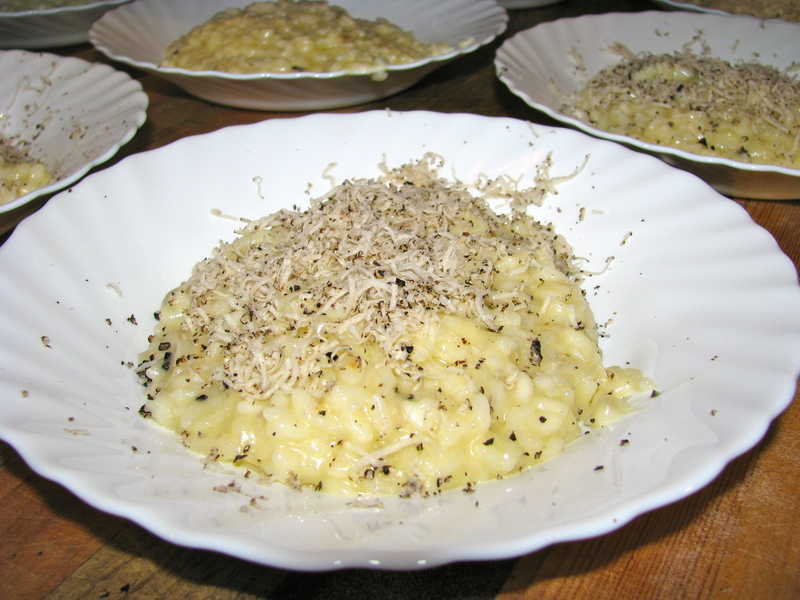 They grated truffle into the rice near the end and finished with small amounts of butter and parmesano. 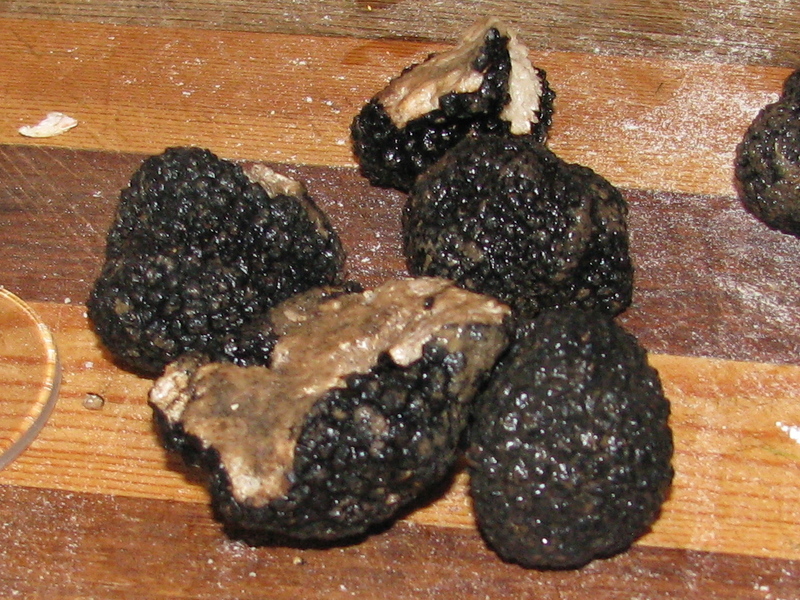 The object was to add nothing that would take away from the truffles. The result was better than anything I have ever made. 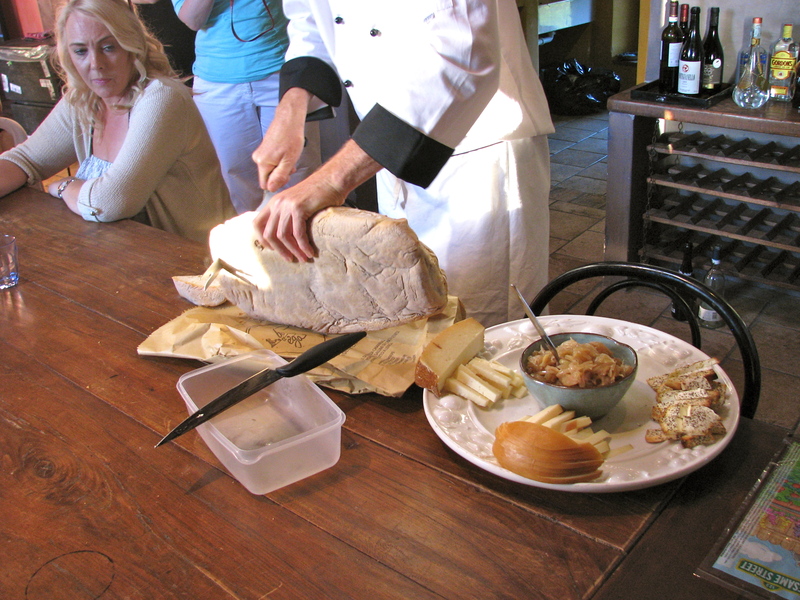 This was the highlight of the evening as Chef Jean Luca made the local Stringozzi pasta for us. He piled about eight cups of flour – four each of “00” extra fine and “0” fine on the wooden counter, made a hole in the middle, added six eggs and about a cup of water. After mixing the ingredients, he kneaded the dough by hand, which he let rest for only about 10 minutes. The rolling and cutting process was fantastic. The photos below are the best way to show this. 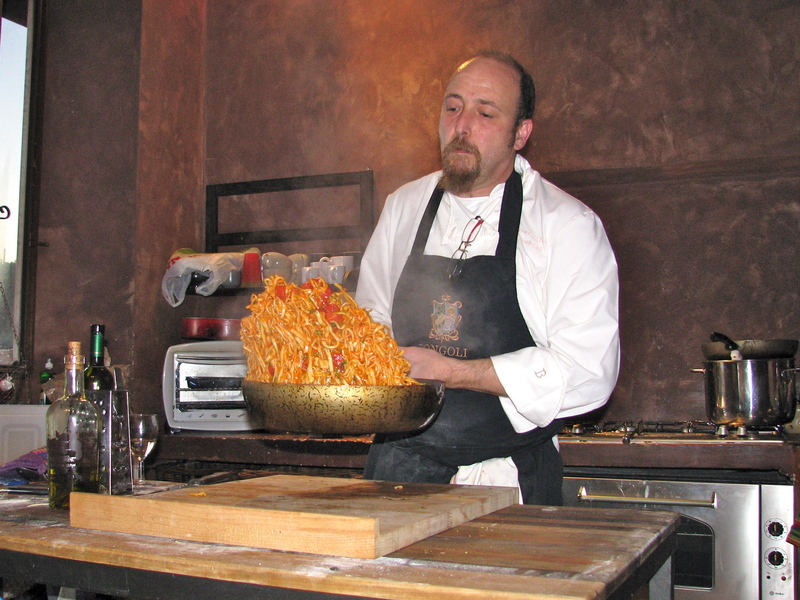 This pasta was served with a fresh tomato sauce that was cooking during the whole process. It was made with organic cherry tomatoes they brought with them. In Umbria, they take day-old bread, cut it into chunks and toast it in the oven. 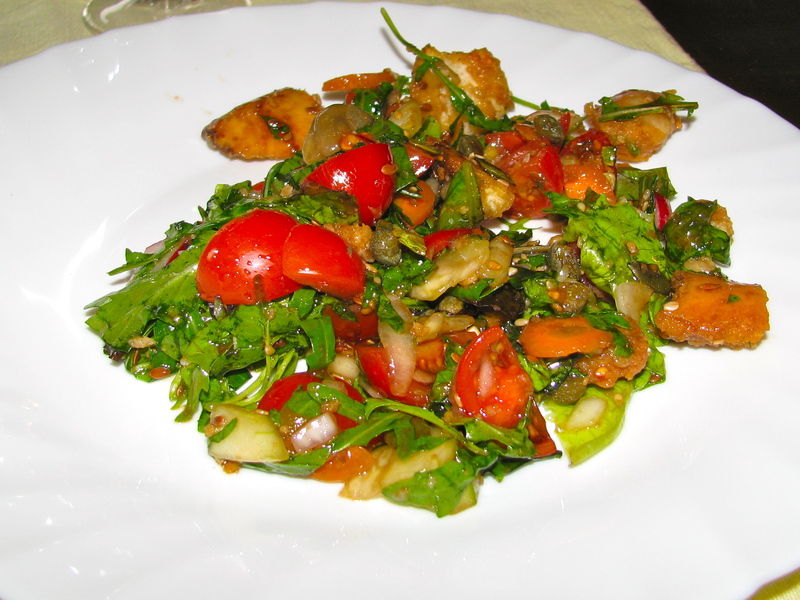 This is then added to a salad which is usually arugula and cherry tomatoes – two very common ingredients in the region. Add some carrots, cucumber, olive oil, salt and pepper and a few splashes of balsamic and you have a great salad with lots of crunch. While preparing the pasta, Jean Luca was supervising the chicken cacciatore, which was browned first in olive oil and then braised on the stove for over 30 minutes in a special organic white wine (which was cloudy and very vinegary). The only other thing added was fresh herbs that the chef had cut before coming – wild fennel, rosemary and basil. 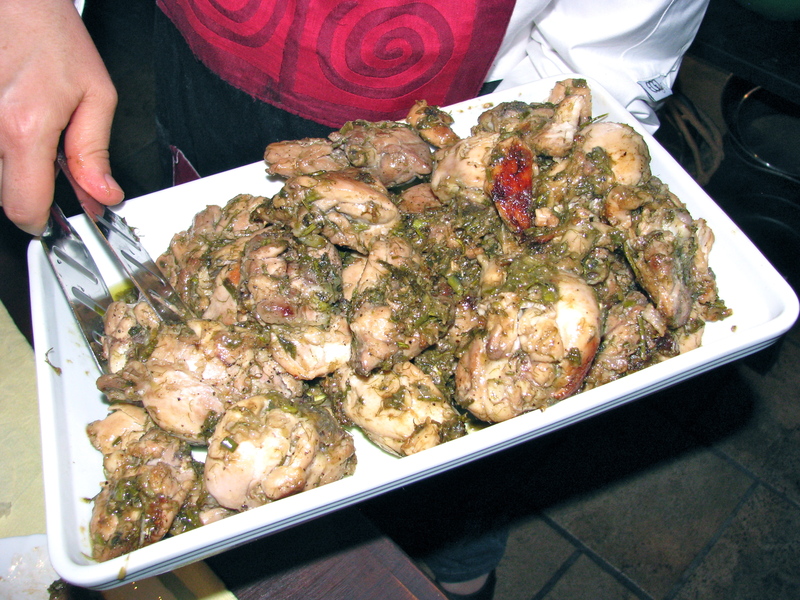 The result was strongly herbed chicken (thighs and legs only) with a thick coating of white wine reduction sauce. It was great and there were no tomatoes, peppers, oregano and all of the other things you ususally find in this dish. I think I like the Umbrian version better. 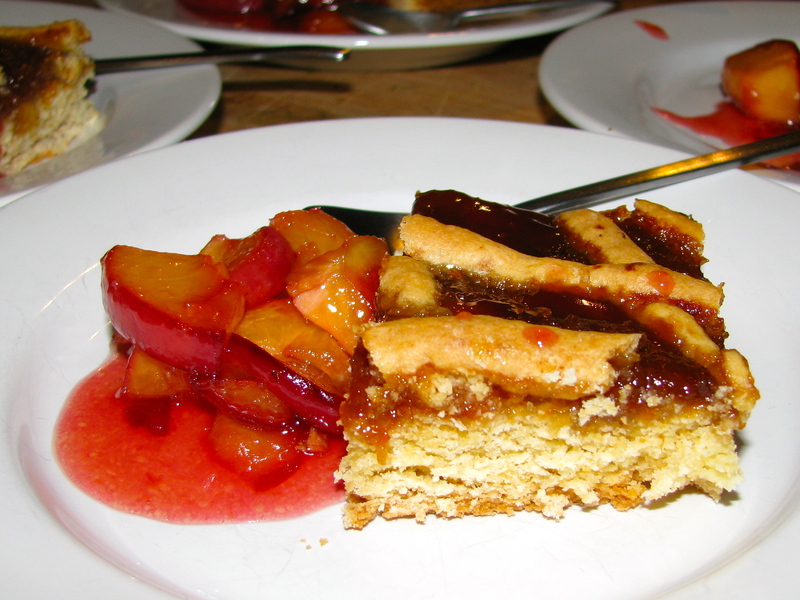 Dessert was a homemade peach torte (it is peach season in June here although that seems early to me) served with fresh peaches that were poached and flambeed with Vecchia Romana – a common Italian brandy. What a wonderful evening. Sometime I need to tell you about the wines we had. The chefs drank right along with us. Looks and sounds like a fantastic trip to Umbria. Hoping your return flight has no extra charges for excess baggage!